These meals are from a couple of weekends ago. My parents had my fiance and I over for dinner to celebrate our engagement. Everyone else had steaks... 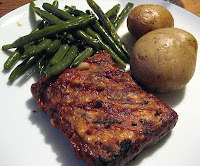 I had BBQ tempeh! 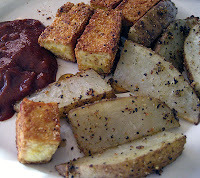 I made the delicious BBQ sauce found in Vegan with a Vengeance because it is truly divine in my opinion. I thought the tempeh was too dry as pictured, so I poured some of the extra BBQ sauce over the tempeh after the photo was taken.